Danish Foods Limited is a very popular and well known company in Bangladesh. They invites application from educated candidates for the post of Plant Engineer, Operator (Blow Molding), Operator (Filling System), Operator (Shrink Label), Operator (Shrink Wrapping), Operator (Injection System). Only Bangladesh interested candidates can apply for these posts. Applicant should have qualification EEE/ ME and Minimum HSC from science background. Applicant must be minimum 8-10 years working experience for the post Plant Engineer and 3-4 years experience for all post with related field. The last date of application is February 10, 2016. 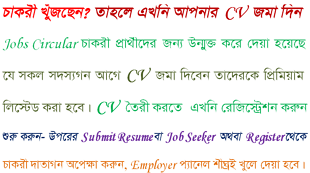 Educated and interested candidates can apply for these posts with their complete CV, recently taken 2 copy passport size photographs to the following address: Deputy General Manager, HR, Partex Star Group (Cx-2), Shanta Western Tower, Level 13, Bir Uttam Mir Shawkat Road, 186, Tejgaon Industrial Area, Dhaka-1208.